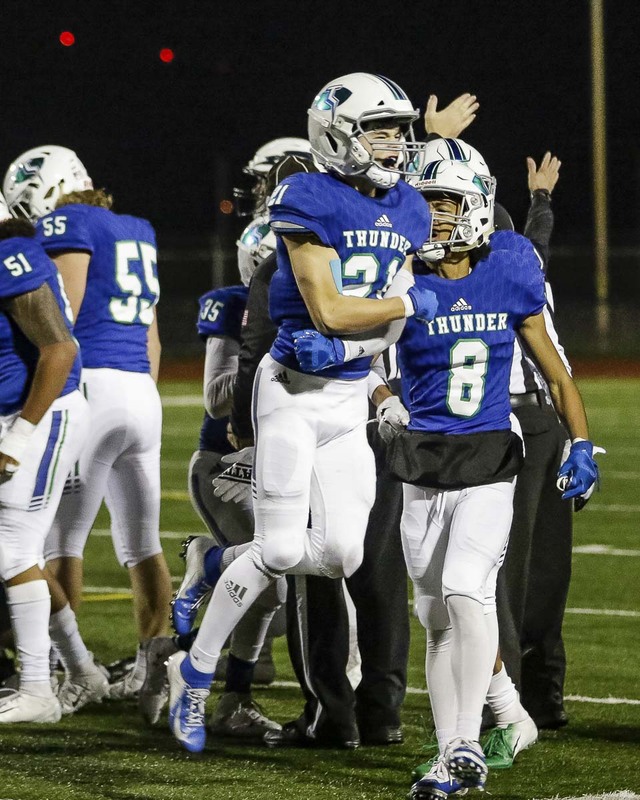 VANCOUVER — The Mountain View Thunder had their priorities in order Saturday night at McKenzie Stadium. The state football playoffs?The seeding? Any thoughts at just how far this team could go this postseason? None of those things mattered. The Thunder executed a near flawless plan so they could hang out together at least another week. That’s the main goal. Just keep this team together. Or in this case, Saturday. 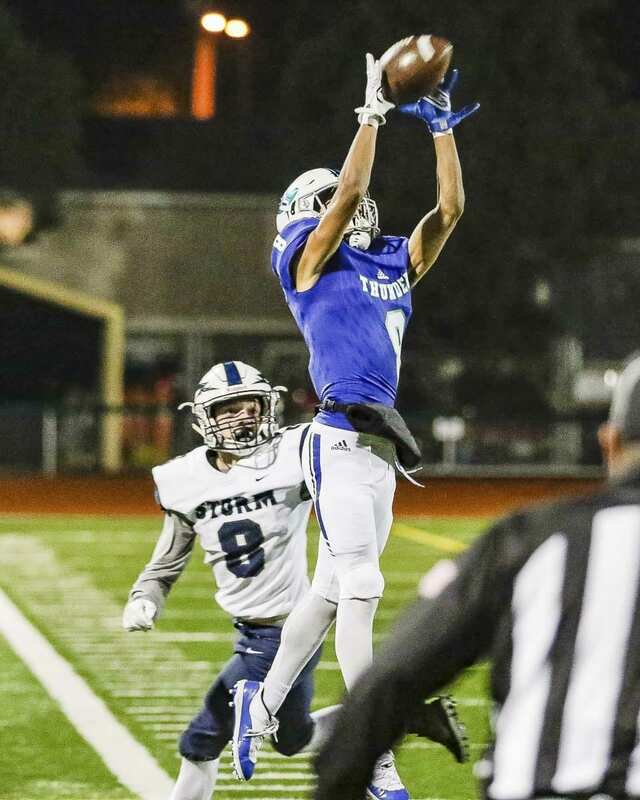 Mountain View worked to near perfection in the first half and ended up with a 42-0 win over Squalicum in the opening round of the WIAA Class 3A state football playoffs.The Thunder will host Rainier Beach next week in the quarterfinals at McKenzie Stadium. Day and time to be determined. 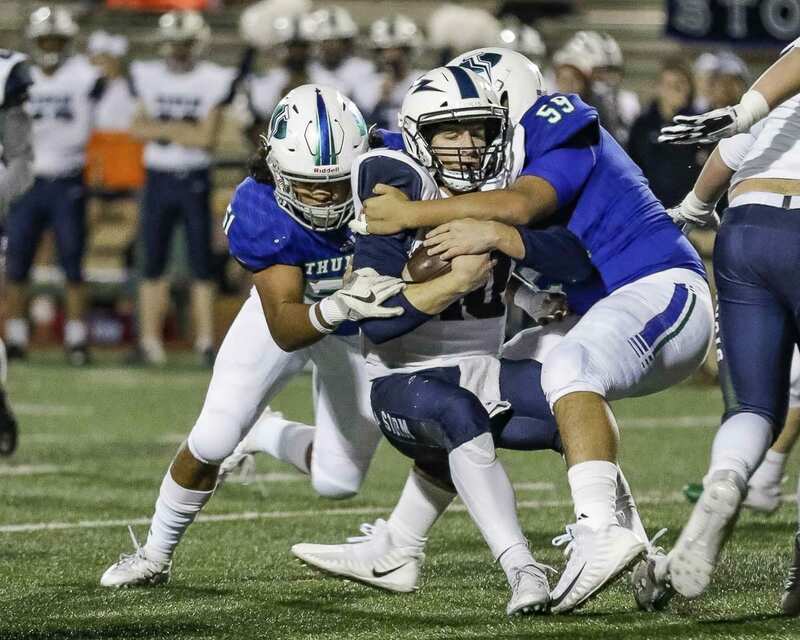 Moen threw for two touchdowns and rushed for two, Jack Mertens had a 100-yard rushing game, and the Mountain View defense forced five turnovers in the shutout. Anderson, Michael Bolds, and Phillip Earnhardt had interceptions for the Thunder. Oh yes. Squalicum rushed for more than 550 yards last week. Against Mountain View, the Storm managed just 93 yards on the ground. “The linebackers and d-line did a great job rallying to the ball,” Bolds said. Mountain View also recovered two fumbles. The Thunder offense capitalized on all five of those turnovers with touchdowns, spreading the ball around, spreading the love around. Mertens had a 41-yard run on the first drive of the game, capped by a 1-yard TD run by Moen. Makai Anderson had back-to-back catches on the second drive, the second coming on a 9-yard touchdown pass from Moen. Moen made it 21-0 early in the second quarter. A Moen-to-Mertens 31-yard pass set up that score. Mertens cashed in from 2 yards out after Bolds intercepted a Storm pass and returned it to the 9-yard line. Then came the drive that truly showcased Mountain View’s dominance. Phillip Earnhardt started it with an interception on defense at the Mountain View 4-yard line. From there, the Thunder went 96 yards on nine plays to go up 35-0. There was a 26-yard pass to Bolds, and then a 29-yard pass to Rodolfo Montiel. Later, it was Earnhardt finishing the drive with a 15-yard TD pass from Moen. Up 35-0 at the half, the Thunder did not relax. Things were going so well for Mountain View, the Thunder even scored by accident. Moen acknowledged he was intending to throw the ball to Earnhardt, but he threw too hard. The ball skipped off a hand and into the arms of Makai Anderson, who broke free for a 63-yard score, turning this game into a running clock. In all, Mountain View recorded 415 yards of offense, with 309 in the first half. “I have to give it up to my O-line, the guys up front, the Hoggies,” Moen said. The Hoggies. The receivers. The backs. The defensive players. The guys supporting from the sideline. They all get at least another week together. RUSHING: Squalicum — Devonte Powell 5-17, Spencer Lloyd 17-66, Ben Schlenbaker 6-10, Dedrick Mitchell 3-4, Mason Lloyd 1-(minus 4). Mountain View — Mertens 12-110, Moen 11-40 Earnhardt 5-26, Tresean Foreman 3-16, Malikiah Batties 1-4, Kury Santiago 1-0, Xavier Mayo 1-(minus 2). PASSING: Squalicum — Lloyd 17-29-2-177, Mitchell 0-1-1-0. Mountain View — Moen 12-14-0-221. RECEIVING: Squalicum — Zach Tucker 2-31, Collin McEachran 5-29, Mitchell 6-84, Schlenbaker 1-12, Bryce Pennock 2-19, M. Lloyd 1-2. Mountain View — Michael Bolds 3-33 Anderson 5-110, Mertens 2-34, Rodolfo Montiel 1-29, Earnhardt 1-15.